First Line: "It's my good luck you're here." If it's January in Star City, it's time for the annual Film Festival, and the small town in the mountains of Utah is filled with movie stars, skiers, and fans. They all seem to be visiting the shops in Bygone Alley, including The Rescued Word where Clare Henry and her grandfather put new life into old typewriters and restore beloved books. One of the visitors to the Henrys' shop is the wildly popular star, Matt Bane, and when Clare sees him being led out of the Fountain Hotel in handcuffs mere hours after his visit, she can't believe what she's seeing-- and hearing. Bane is accused of killing his sister, but Clare doesn't believe a word of it. Before you can shout "Action!" she's off to bring the real killer to justice. Paige Shelton's "Star City" setting in the mountains of Utah sparkles in this second book of her Dangerous Type mystery series. Readers get to see the town filled with skiers intent on conquering the slopes and movie stars hoping that their latest films do well in the festival. Clare Henry isn't the type to become starstruck, which makes her favorable reaction to superhero star Matt Bane even more profound. There's something not-quite-right about how new police chief (and Clare's ex-boyfriend) Creighton is handling the arrest and that gives Clare even more incentive to conduct her own investigation. 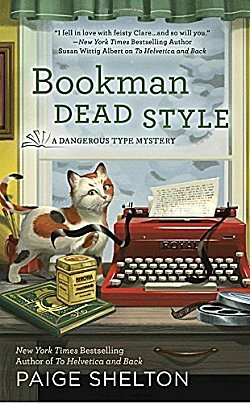 Bookman Dead Style has the feel of a book that's filled with insider information about its setting, which is a fictionalized version of Park City. Super secret parties thrown by a Hollywood megastar. Allusions to a world-famous author who rents an unusual space where she goes when she needs peace and quiet to write. Getting tickets to the various films being shown. In addition, there's always something new to learn about business facets of The Rescued Word. This time, it's ribbon tins-- the packaging typewriter ribbons came in back in the day. The tins figure in a separate crime, and now that I've seen them I understand why people would want to collect them. Shelton brings in a character who's a "sister wife"-- a member of a polygamous family-- and since the character had little to do with the plot, I have to wonder if she'll figure in a future book in the series. I'll just have to wait and see, albeit a bit impatiently because I'm certainly enjoying this series! I like the sound of the setting for this one, Cathy. Never heard of collecting ribbon tins before, but it sounds interesting.